I have been talking about baking with alternative flours a lot on this blog. Last week we discussed how biscuits are the silent culprits of sneaking in more carbs and sugar and even trans fats into our system and how home baked cookies and bars with buckwheat could be one of the answers to packaged biscuits and cookies. 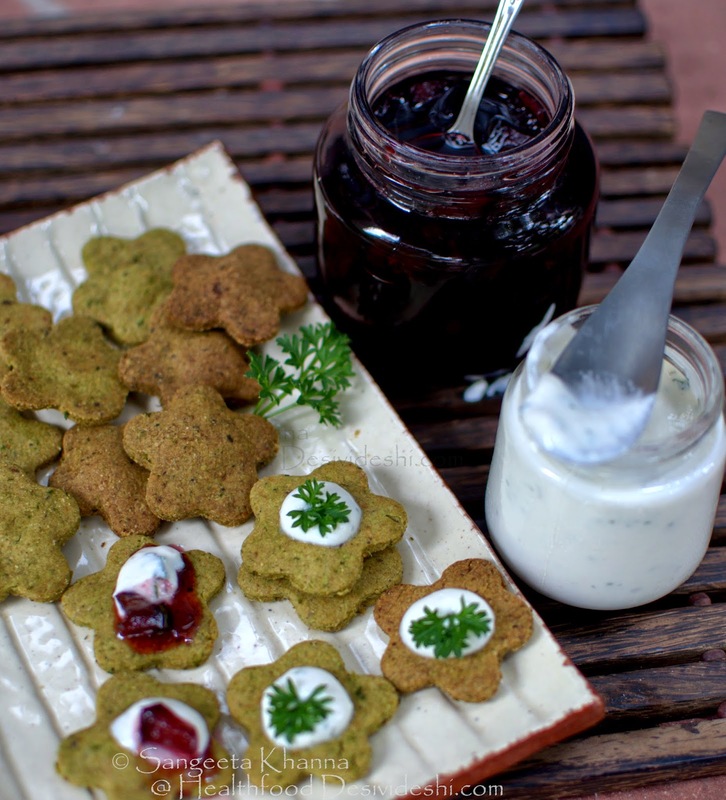 How about adding more variety to the tea time snacks and appetizers and baking some savoury crackers? I call these crackers as slow foods as these are very low on glycemic index and release the calories slowly into the blood. Not only that, you tend to eat these crackers slowly, enjoying every bite and hence consuming lesser amount of snack as compared to a packet of chips or potato wafers. Bake them from scratch, use your kitchen gadgets to make the process easy and enjoy snacking in a healthy way. 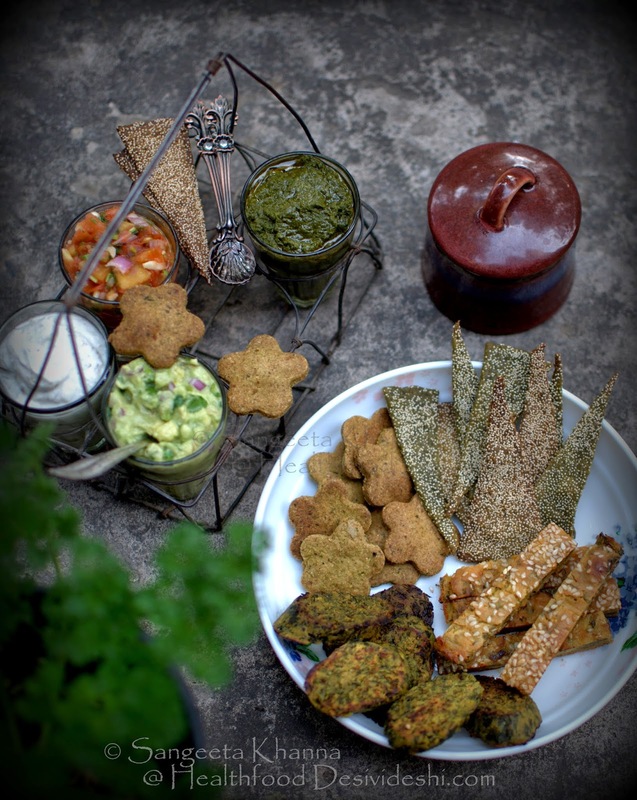 Serve the crackers with fresh fruit salsa, quark cheese dip or guacamole or hummus to make it a mini meal. 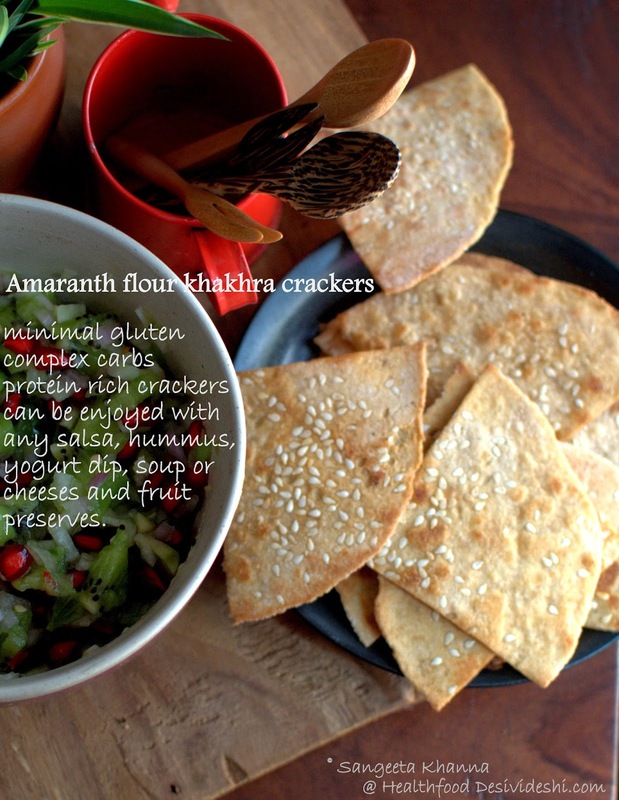 Replacing white flour with millet flours like ragi (finger millet), barley and jowar (sorghum) or with flours of pseudo grains like amaranth and buckwheat is easy to work with when baking thin crackers. All these flours behave differently when made into a dough or mixed with water but one can play with them by adding a bit of chickpea flour or a little whole wheat flour if one is not bothered about gluten sensitivity. All this experimentation will be worth when you see how tea time snacking has become healthier and even party appetizers have become more fun and healthy as well. Healthy baking is no rocket science. You just follow your choices and work around with flavours you like and add them to whole grain flours. Once you start using some herbs or greens for flavouring and some seeds for texture and crunch you would see how whole grain flours are suited very well for crackers. The texture of the crackers is more crunchy (not crisp) and more nutty owing to the whole grain flours. Adding poppy seeds and sesame seeds is my favourite way of adding value to the crackers and making them look beautiful too. Mix the flours with salt and rub the butter and green chilly paste (if using) thoroughly in the flour mix. Knead the dough using the spinach or bathua puree. You may need less or more of the puree depending on how thick is the puree. You can mix everything except poppy seeds in a food processor and knead the dough. Now roll out small discs (like roti) using poppy seeds as dusting and cut the disc into thin wedges. Repeat with all the dough and make wedges to be baked into crackers. Lay all these wedges on the baking sheet and bake at 170C for about 20 minutes or till they turn crisp. You may need to bake 3-4 batches of these crackers but the crackers bake fast so the whole process takes a little more than an hour. Store in airtight container and serve with choice of dips or with Indian chai. Pulse everything in the food processor till a firm dough is formed. Trickle the milk slowly so the dough is stiff and firm, you might end up using more or less milk. Roll out a sheet using the whole dough at once and cut out any shape you like for crackers. I like these crackers a little thicker but you can make them as thin as you wish. Use the trimmings to roll out again and cut out more crackers. Spread all these crackers on a baking sheet and bake at 170 C for about 25 minutes of the crackers are about half a cm thick. Watch out after 15 minutes of baking as all crackers burn really fast. I like serving these with plum balsamic preserve and quark-garlic-parsley dip. You can have them as it is or with tamarind chutney. pulse everything except poppy seeds together in food processor and make a dough. Trickle the milk slowly to make a stiff dough. Divide the dough in 10 portions and make balls with them. Roll out flat thin discs using poppy seeds as dusting and roast them all on a medium hot griddle till light brown spots appear. Prick with a fork while roasting on the griddle to prevent them from puffing up. Repeat to make 10 roti like khakhras that will not be fully crisp. Cut the half cooked khakhras using scissors and bake them all at 170 C for about 10 minutes or till the khakhras get crisp. 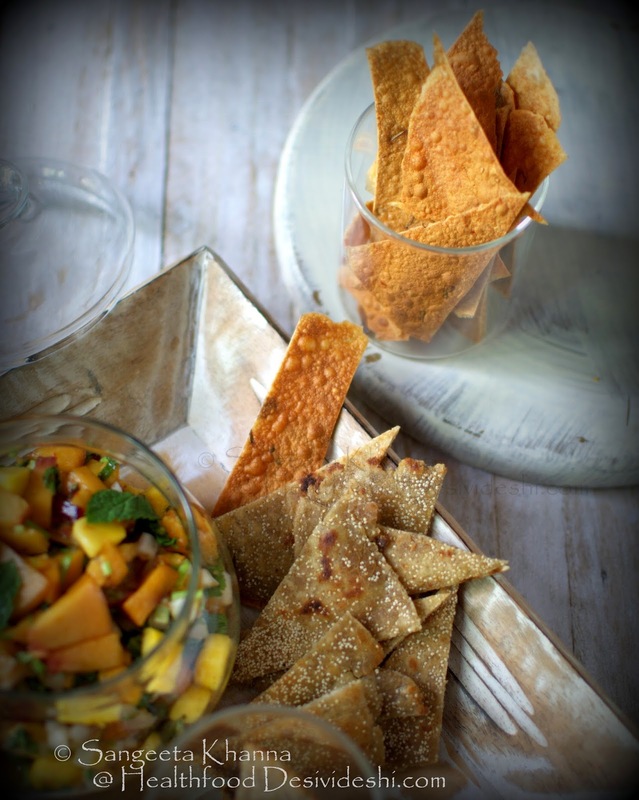 I served these mixed grain crackers with a peach salsa that I made couple of weeks ago. Make powder of 1/2 cup sesame and mix with the flours and salt. Make a stiff dough using the water or milk. Roll out small discs after dividing the dough into a dozen small balls. Roll out thin using sesame as dusting so the sesame seeds stick to the surface. Roast them all on medium hot griddle till faint spots appear. You can press these discs over the medium hot griddle using a rolled up tea towel till the khakhras get crisp or bake them just like the mixed grain khakhra crackers above. I usually cut these in quarters if baking them and leave them as discs when roasting them over griddle. 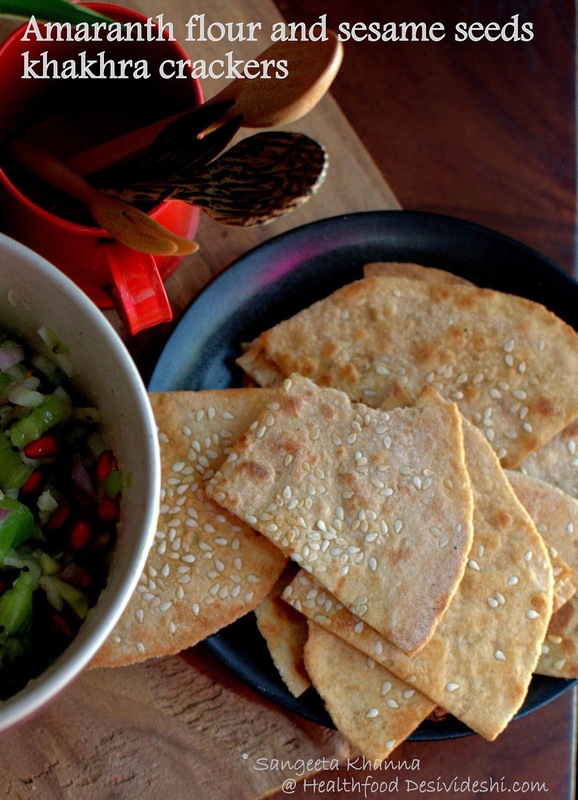 These crackers taste great with any sweet and tart salsa too. 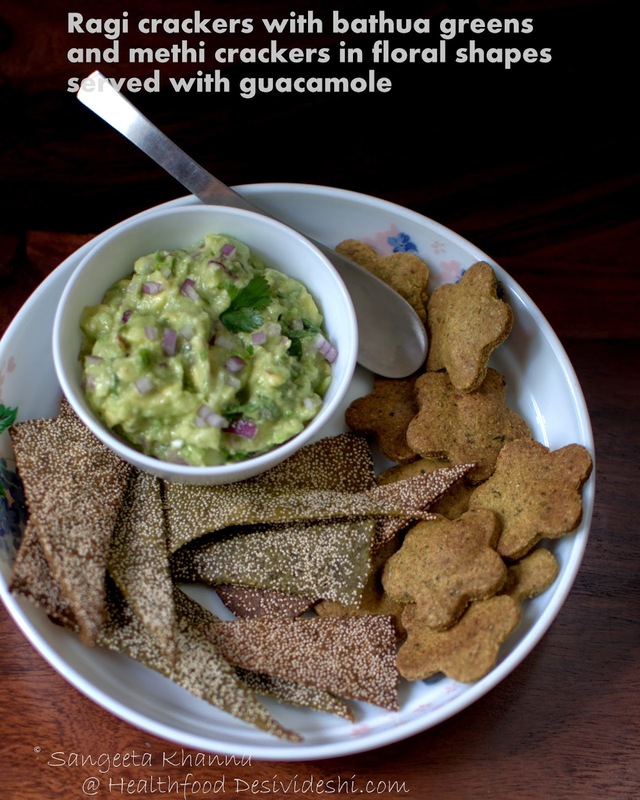 I served them with kiwi salsa once and the crackers were in demand for some time. Now I serve them with basil pesto or with cucumber raita or even pineapple raita. Mix everything except whole sesame seeds together in food processor to make a stiff dough. Gather the dough and roll out over a dusting of sesame seeds. Flip the rolling dough to coat it with sesame seeds on both sides. Keep the thickness a little less than half cm. Cut out any shape you like and spread them all on a baking sheet. Bake on 170 C for about 20-25 minutes or till the crackers are crisp. These were not one of my favourite crackers but my parents loved it quite a lot. My dad loved these with his tea or coffee and my mom wanted some tamarind chutney or mango chutney with this one. I tried these with tamarind chutney too and topped them with chopped onion etc to make them like papdi chaat. That is a better way to enjoy quick chaat when these garam masala crackers are around. Later these crackers grew on me and I started having them with green chutney and even with karonde ka achar. 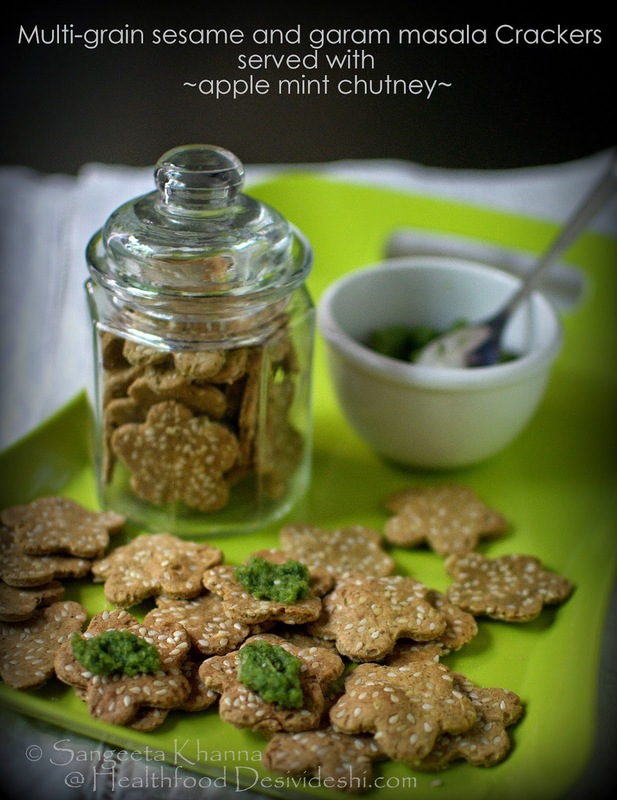 This one is a green chutney made with tart apples, mint and coriander greens along with a green chilly and salt. Some chutney on these crackers make it such an enjoyable treat. Now I break a couple of these crackers over my sprouts chaat as well. These lentil cookies have already been a favourite and I bake them often with different seasonings. That reminds me, I have to bake a big batch of those for my dad who actually needs something to munch on 2-3 times a day. How many of these whole grain crackers are you baking in your kitchen? I know each one of these will be a favourite and you would realise how easy it is to eat healthier and chuck those packets of wafers and biscuits. oh wow..that's a bundle! enjoyed reading this! 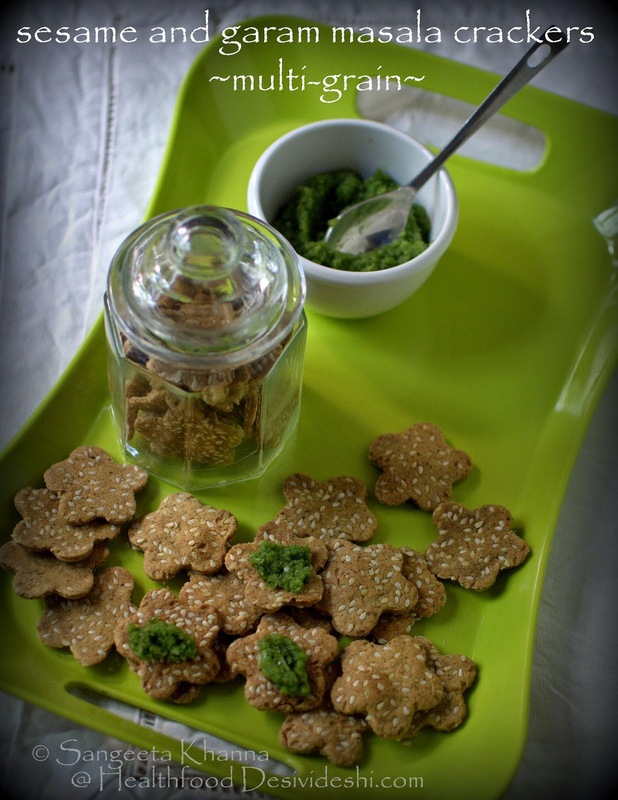 wow wow such an crunchy and healthy crackers :) I wud love to grab some right away !! These are lovely ideas. I don't have barley flour and poppy seeds. I want to make them tomorrow. Can I substitute with jowar flour and say sesame seeds? All flours behave a bit differently Rachna. 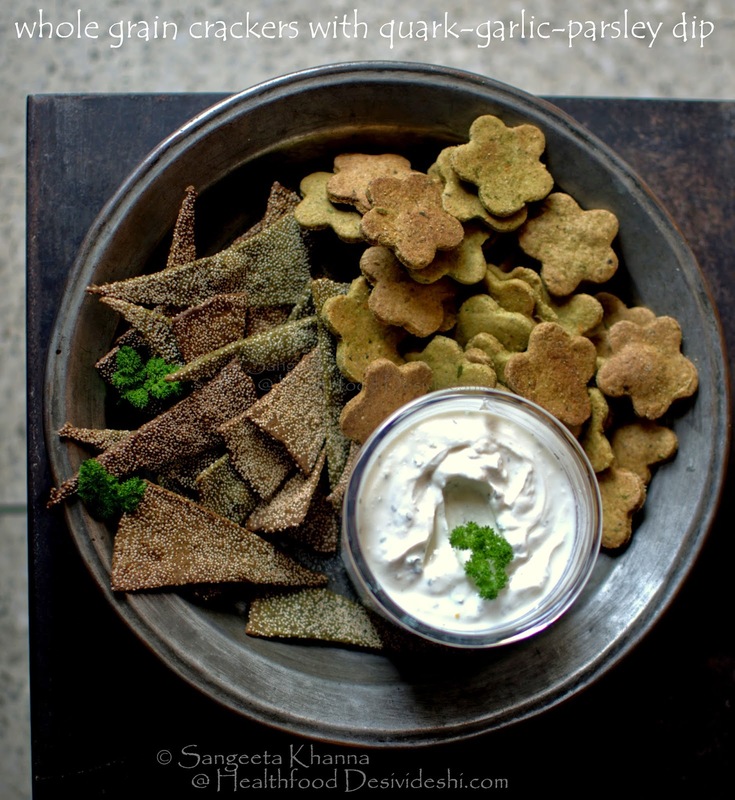 Try making the garam masala sesame crackers with the jowar and sesame you have. These look lovely! Can't wait to try them out! What flour do I have to grind to get barley flour? Do I use pearl barley or whole barley? Pls let me know thank you! Whole barley will be good to to make barley flour.